HARTSDALE, N.Y., Nov. 23, 2010 — A retired Columbia University professor who held the sole patent covering a method of producing LEDs and laser diodes widely used in consumer electronics— and who sued dozens of major electronics manufacturers in Asia and Europe for infringement— has died. She was 83. Gertrude Neumark Rothschild, one of the world's foremost experts on doping wide bandgap semiconductors and Howe Professor Emerita of Materials Science and Engineering at Columbia University, died on Nov. 11, the university announced. 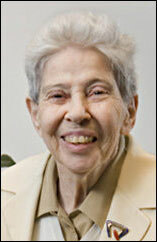 Rothschild began her research career with Sylvania Research Laboratories in Bayside, N.Y., in the 1950s, and later at Philips Laboratories in Briarcliff Manor, N.Y. She joined the faculty at Columbia as a professor of materials science in 1985. She published approximately 90 research articles and was elected as a Fellow of the American Physical Society in 1982 and recognized by the society as a Notable Woman Physicist in 1998. She was the first woman to hold a named chair in the Fu Foundation School of Engineering and Applied Science (SEAS), the university said. During her research work there, she first conceived the doping process that has been the basis for devices improving the quality of consumer products ranging from flat screen TVs to mobile phone screens. Commercial uses for blue and shorter-wavelength lasers range from increasing sharpness of a laser printer to increasing the information storage capacity of a DVD. In addition to these lasers, her patented processes led to blue and ultraviolet LEDs, which are now used for computers, traffic lights, instrument panels, as the background color for cell screens, in multicolor displays, flat screens and in numerous other lighting applications. In a suit Neumark filed in March 2008, she sought to block companies such as LG Electronics, Nokia, Pioneer, Samsung, Sanyo, Sharp Electronics, Sony Ericsson Mobile and Toshiba from importing such products into the US (See Block Sought on Imports). A few months later she considered broadening her suit (See Inventor Mulls Widening Case). She subsequently signed licensing deals with a number of companies named in the case, as well as others that had not been specifically mentioned. She received about $27 million from more than 40 companies in all, her former lawyer, Albert Jacobs Jr., told the newsletter Law 360 in August. “I just want recognition for the work that I did, and I want to show that women can do science,” Rothschild told Nature Photonics. She is survived by her husband, Henry Rothschild. A memorial service will be held for her on Wednesday, Dec. 15, 2010 at 5 p.m., in St. Paul’s Chapel on the Columbia campus. She deserved the Nobel Prize, well in advance to graphene, whose applications are still under development.